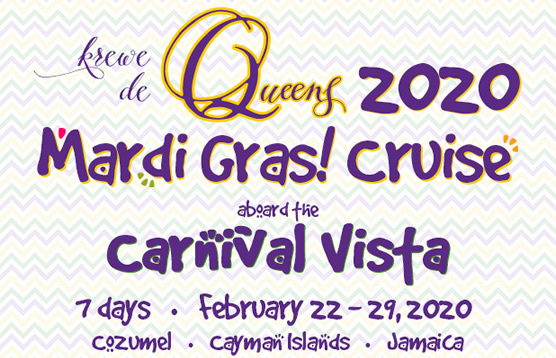 Join Gay Galveston Cruises for our Krewe de Queens - Mardi Gras 2020 gay group cruise aboard Carnival's Carnival Vista departing from Galveston, Texas. You know what they say, Bigger is Better! 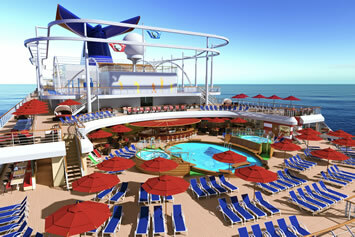 So for 2020, we're jumping ship to the Carnival Vista Carnival's BIGGEST! 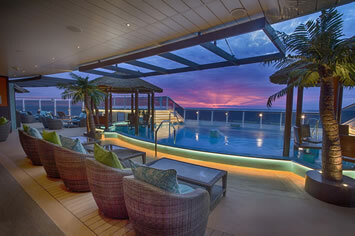 This 7-day cruise makes stops in Cozumel (Mexico), Grand Cayman & Ocho Rios (Jamaica). 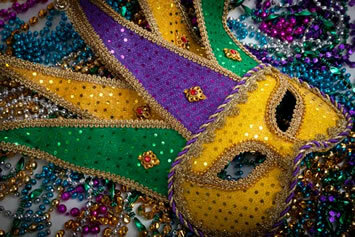 Expect a one-of-a-kind experience celebrating all the sin that is Mardi Gras Plus spectacular drag shows during the cruise. 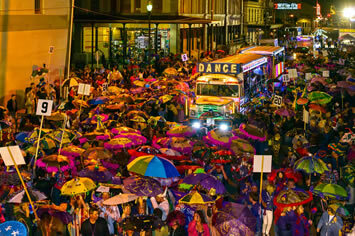 We're going even bigger in 2020 by taking Mardi Gras to Havana! We've blocked ALL the Havana Cabins on the Carnival Vista. The Havana Experience Cabins feature a tropics-inspired decor, private outdoor patio cabanas, and exclusive access to the Havana Pool. Picture yourself enjoying the sun by pool! Don't stay home in the snow! 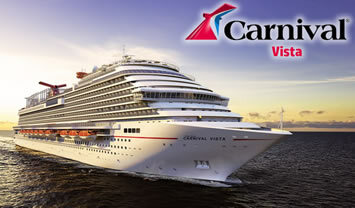 The Carnival Vista is Carnival's biggest cruise ship! She has delivers a truly unique experience at sea. Let's start with outdoor fun. You can't help but have your eye caught by - wait, are those flying bicycles? Pretty much! SkyRide at SportSquare is a twin-track suspended bike course - strap in and race around for the win or just cruise for great views. At Havana Bar & Pool you'll find an island retreat that evokes classic Cuban-style lounging with an emphasis on style… and on views, and on traditional cocktails! Carnival WaterWorks is packed to the gills with wet ways to get-a-splashin', including Kaleid-O-Slide which adds funky light and color effects to the usual “speed-n-splash” story. If you can't get enough Guy Fieri, we invite you to try at Guy's Burger Joint and Guy's Pig & Anchor Smokehouse. Rounding out this ship's sunlight highlights is Serenity Adult-Only Retreat, the low-key grown-up spot that's more lounging and hot tubs than action and adventure. Indoors, things are every bit as cool. Take RedFrog Pub & Brewery for example - yes, you read right, the latest incarnation of our Caribbean-cool pub has a fully-functional onboard brewery that produces exclusive craft beers you can enjoy just feet from the brewing kettle. If you do seafood, you'll want to direct your appetite to Bonsai Sushi or the seaside Seafood Shack, while JiJi Asian kitchen and Cucina del Capitano are prepared to satisfy cuisine-specific cravings. On the stateroom side, Carnival Vista adds two new types of rooms to the mix: Family Harbor is a special area reserved for families and features a private 24-hour lounge and concierge service. All Havana staterooms and suites are located just off the Havana Bar & Pool and feature a unique tropical décor, while Havana Cabanas add a patio with hammock chair! 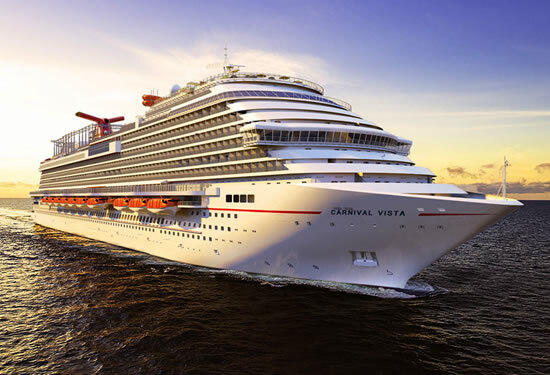 One last thing you should know: on Carnival Vista more onboard places than ever before span the indoors and outdoors - so whether you set the thermostat to "cool-and-crisp" or "sea-breezy perfection" you'll enjoy your kind of Caribbean comfort on Carnival Vista. 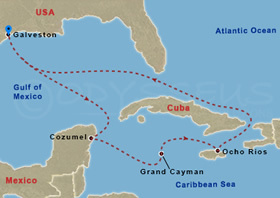 • Two spectacular drag shows during the cruise; one each sea day. • Meet-ups each day around the ship at different venues. 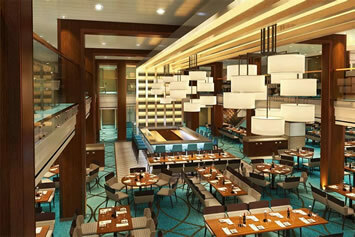 • We will all be seated in one large section for dinners in the main dining room. • All food, including room service, Guy's Burger Joint, Blue Iguana Cantina (like Chipotle), Lido Deck buffet, Pizzeria, Deli, and the ICE CREAM machine! 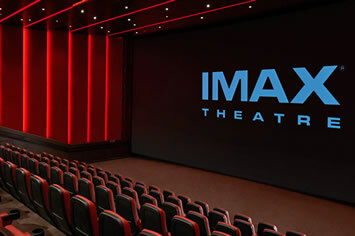 • Access to our Exclusive Events. • Coffee, tea, lemonade, juices, and water. • Broadway-style shows performed by the ship's entertainers. 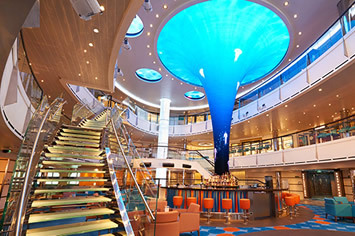 • All activities on the ship such as the waterslides, SkyRide Bikes, sports court, karaoke, nightclub, Punchliner Comedy Club, Movies under the stars, pools, and adults-only Serenity Deck. 23 Feb A Day at Sea! 27 Feb A Day at Sea! 28 Feb A Day at Sea! 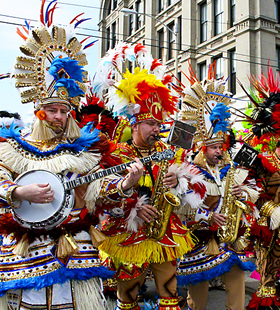 Founded in 1836 and located in the Gulf of Mexico, historic Galveston is a semi-tropical barrier island. Only 39 miles long and 2.5 miles wide, it lies 50 miles southwest of Houston. Long known for its miles of sandy beaches and Gulf seafood, today Galveston is also recognized for its treasure trove of Victorian architecture and one of the most vigorous historic preservation programs in the country. Galveston has a way of enticing visitors to linger longer. 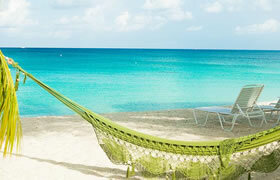 A delightful destination, this island offers sandy beaches, boutiques and top-notch dining. Take a carriage ride through the Historic District or wander the Strand District. Discover the giant pyramids at Moody Gardens in Galveston, Texas, designed to educate visitors about the rainforest and oceans. Test your mettle on the thrilling high ropes or have fun in the amusement park. 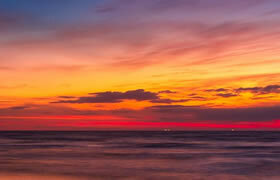 Swim, bird watch, hike, bike or relax in the Galveston Island State Park, with its unspoilt beaches and nature trails. Galveston Island has 14 museums, including the Ocean Star Offshore Drilling Rig and Museum. Cozumel features great diving, snorkeling and beaches, marine-life encounters, botanical gardens, trails and shopping in the town of San Miguel. 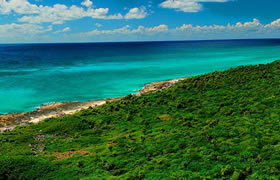 The nearby mainland is home to Tulum, Mayan cliffside ruins overlooking the Caribbean. Drive your own mini submarine, snorkel on world famous reefs or see the colourful underwater world by glass bottomed boat in lovely Cozumel, on the Caribbean coast of Mexico. There are fascinating Mayan ruins to explore too and abundant wildlife, including brightly-hued tropical birds. Look out for dolphins, manatees and sea turtles in the lovely lagoon and underwater caverns of the Chankanaab eco-park. Scuba divers are spoiled with a dozen dramatic dives from the Palancar Canyon to the Santa Rosa wall. But a dive in the deep is not the only way to get your feet wet. Swim with dolphins at Dolphinaris, paddle in clear kayaks, snorkel coral reefs or enjoy Cozumel’s miles of beaches. Discovered by Columbus in 1503, these islands are a popular resort and British Crown Colony that still provides travelers with unspoiled beauty. As a destination known for its superb diving opportunites, the Caymans are home to unforgettable ship- wrecks, brilliantly colored fish and Caribbean-clear water. Experience a once-in-a-lifetime adventure: snorkeling with stingrays at Stingray City Sandbar. These relatively tame creatures will swim right into your arms and eat from your hand. They have velvety soft skin and love to have their bellies rubbed. Despite their frightening name, they are very gentle and won't hurt you as long as you stay away from their tails. Located on Jamaica's North Coast in the Parish of St. Ann, Ocho Rios offers breathtaking sights and exhilarating adventures for visitors of all ages. In the last twenty years, "Ochee", as it is known by the locals, has grown from a small, sleepy, fishing village into a world class tourist destination. With a deep water pier that can hold up to three cruise ships, allowing for easy disembarkation, Ocho Rios has become Jamaica's premier cruise port. Just west of downtown Ocho Rios, you'll discover one of Jamaica's most famous waterfalls - Dunn's River Falls. The cool mountain waters plunge 600 feet to smooth limestone beds, then stream under the roadway before mingling with the turquoise Caribbean Sea. Whether you climb the falls or swim in the chilly eddies on the ocean side, you're sure to remember this place. 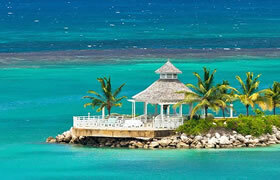 Taxes & charges of $54 pp ($104 for suites), Gratuities of $ 96 pp and optional insurance are additional. In addition to the cruise fare above, we will be adding a $50 per person Entertainment charge to help bring you the amazing performers. Also included are the traditional Galveston Gay Cruise activities, subject to minimum participation. To enjoy Gay Group functions and excursions you must reserve room with us. Web Page © Happy Travel, Ltd. Logos and Images © RSVP Productions Inc., Atlantis Events Inc., Chumley Bears, etc.